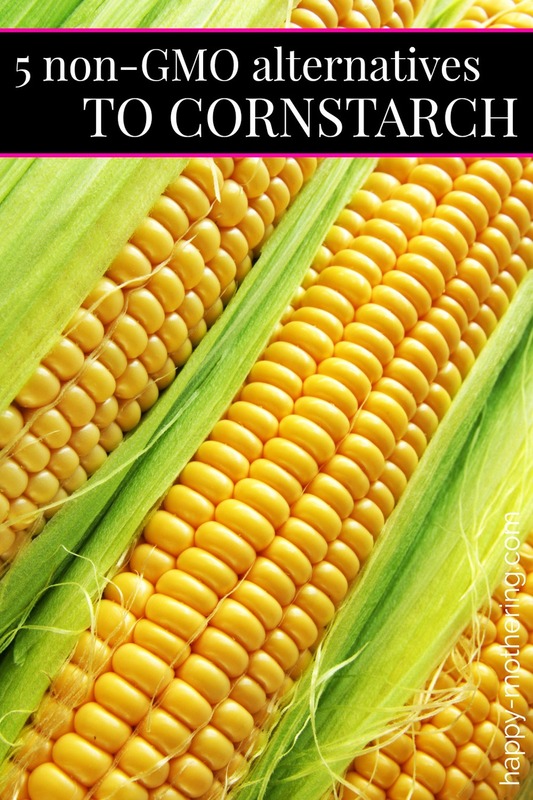 Do you want to avoid genetically modified corn and other GMO ingredients? Learn about the 5 best organic and non-GMO alternatives to cornstarch. Growing up, we always had a yellow container of cornstarch in our cabinet (the one with the blue lid). It was used in many dishes and we liked to use it for science experiments. However, I grew up before the introduction of GMO corn. Now, we have to be very cautious to avoid all ingredients that are derived from GMOs, and cornstarch can be one of the bigger challenges to avoid if you cook from scratch – unless you know that there are alternatives available. Here is a list of 5 non-GMO cornstarch alternatives. My first choice cornstarch substitute is Arrowroot Powder. It has a very neutral taste (I can’t stand the taste of cornstarch anymore) and it produces a nice, shiny sauce. It may be substituted in an approximately equal amount to cornstarch, but may need to be cooked a bit longer to get the same effect. Tapioca is usually my second choice to Arrowroot Powder, mainly because I have it on hand and can grind it fresh as needed. It’s also less expensive than Arrowroot Powder if budget it a concern. You can usually substitute 2 teaspoons of Tapioca Starch in place of 1 tablespoon of cornstarch. The first substitute I tried when we started trying to avoid GMOs was Potato Starch. It’s usually available in the baking aisle, but you want to look for an organic brand since potatoes are often sprayed with anti-sprouting chemicals. Potato starch works well for gravy and many other things. Just substitute 2 teaspoons for every tablespoon of cornstarch. Another alternative that I haven’t tried yet is rice starch. Like tapioca and potato starch, you’ll need to substitute 2 teaspoons of rice starch for every 1 tablespoon of cornstarch. My last choice is to purchase a non-GMO cornstarch. The reason it’s my last choice is because there is such a high chance of cross-pollination of GMO corn to non-GMO corn. With 95% of corn being GMO now, I try to avoid it where possible – though that is a definite challenge with some items. These are our five favorite non-GMO alternatives to cornstarch. We hope you find a new favorite too. What is your favorite non-GMO substitute for cornstarch? I was so happy to see you do this post! We use arrowroot and I’m happy with it but it’s good to know about the other alternatives and this is such a nice post to share with others. Great list, Chrystal! We use arrowroot powder, but it’s great to have a list of other alternatives as well. Because I eat gluten-free, I usually have arrowroot powder on hand, though I ran out recently which is why I ended up getting tapioca powder. I was worried about not having alternatives, but not anymore. My understanding is that potatoes are almost always GMO as is rice. Have you heard that? No, I haven’t heard that because it’s not true, but you should always choose organic because of the anti-sprouting chemicals that are sprayed on non-organic potatoes. I’ve used arrowroot powder in place of flour to thicken cream of chicken soup. The arrowroot gave a slimy consistency. Is there any way to avoid this, or should I use a different starch in a pudding or gravy recipe?